What is your torso length? Waist trainers are becoming increasingly popular mainly because of their publicity by celebrities and also because of their effectiveness. With their popularity many companies have started manufacturing these products and are available in the market in many types and sizes. You need to choose from among them in accordance to your personal preferences. You choice will become inevitably tough considering the extent of variety available in the market. You need to do a little research regarding what types of best waist trainers are available and keep some factors in mind to make the perfect choice. Choice of your waist trainer plays an important role in its effectiveness. Here is a list of questions you need to ask yourself before placing an order for your waist trainer. Waist trainers have 2 broad categories: corsets and cinchers. To select from among them, you need to ask yourself why you want one in the first place. To wear it under your dress on a special occasion to make you look slimmer instantly. To achieve long term fitness goals by losing weight and making your waist permanently slimmer. If you are buying it for reason no. 1, you are looking for a corset. They give excellent instantaneous results but do not have weight losing capabilities. Waist cinchers, however, are designed to be worn during workout and stimulate more sweating to enhance the results of exercise. These will produce excellent long term results. If you want to talk about instantaneous results, cinchers take only 1 to 3 inches off your waist as soon as you put it on as compared to 3 to 6 inches for corsets. Waist trainers come in a variety of different styles. You need to make the selection based on your taste and comfort level. These are not very comfortable for long term waist training program. However they provide better support for larger busts. These are less restrictive than overbust and thus more comfortable for waist training. They are also less noticeable than overbust if worn under clothes. These are especially designed to be worn during workout. These are comfortable to wear and work great for long term waist training. Choosing the correct size is very crucial to waist training. If you get a bigger size, it will not produce the desired results in addition to being super uncomfortable to wear! A smaller size will be detrimental to your health. It is therefore necessary to measure the size of your waist carefully and make the right selection. Take measurements of your natural waist. This measurement will be taken just above your belly button or where your waist naturally bends. Whatever your normal waist size is, you will need to order a waist trainer that is 4-7 inches smaller than your natural waist size. However if you want a corset for back support or fashion, order one that is not more than 3 to 5 inches smaller than your natural waist size. Waist trainers come in a variety of different sizes to match the different lengths of torsos for women so that every woman can find a perfect fit no matter how tall or short she might be. To make the right selection, you need to first measure the length of your torso and then select a trainer length accordingly. To measure your torso, start measurement from under one of your breasts and take the measuring tape down to where your leg bends if you lift it. 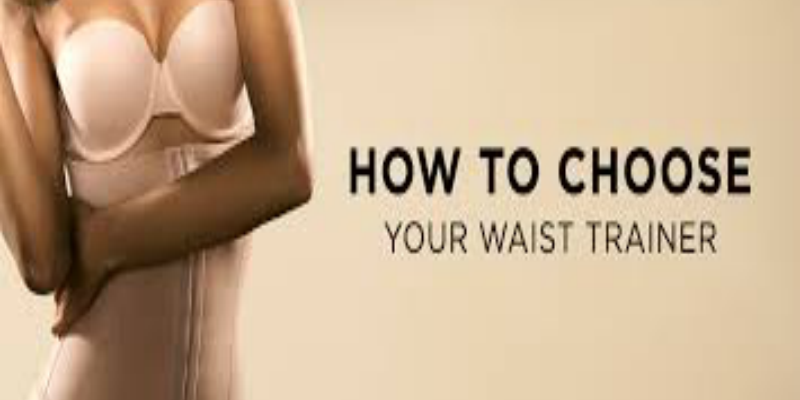 If you have a torso length between 9 to 11 inches you need to order a standard sized waist trainer. For a torso length smaller than this range, you will need to select a short style of trainer. For a torso length higher than this range, your selection will be of a ‘long line’ waist trainer. The right length of waist trainer will be the most comfortable to wear. However if you are looking for a trainer to wear during workout, do not buy one with a long length as it will restrict your movements. Last but not the least; fabric is also a very important consideration. Waist trainers offer a large variety of materials to choose from. You need to select the one that best suits you. Some of the most common fabrics used while designing waist trainers are latex, cotton, satin and leather. Steel boned corsets are also becoming increasingly popular in the market. The best quality waist trainers are made of latex because of its unbeatable compression abilities and durability. If comfort is your priority along with durability you should select a cotton corset. If you want to wear the corset under your clothes, satin is the best option. Your dress will fall over it perfectly without anyone noticing what you are wearing underneath. Leather is for users who prefer style and fashion and is not a suitable choice for daily waist training. Steel boned corsets have a strong structure for greatest compression along with tight lacing on the back.